moe talks a lot: Oil...cleansing? Acne. Ugh. We've all been there. And if you haven't, you're lucky, but I'm sure you have your unexciting, continuing battles too. 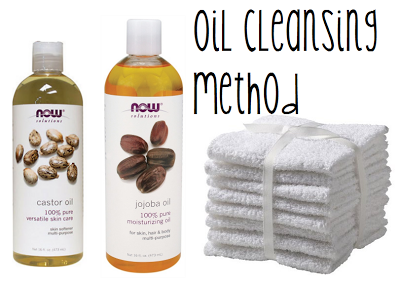 The oil cleansing method seems counter intuitive...like aren't we trying our darndest to be oil free? But it works with your nature of your skin and helps balance you out, while cleaning out all the unwanted gunk. All through high school I tried everything on the shelf that promised to shock my acne into submission. In reality it dried out my skin and made my acne worse. It took my years to realize that I have sensitive skin and that these harsh cleansers were just irritating it and making it way worse! The only thing worse than cover up over acne is cover up over acne + dry, flaky skin, ooo! In college I tried be nicer to my skin and I had a little more funds to try some more quality care items (more funds translates to: I ate top ramen for some nice night cream). My skin care regime got longer and longer as I tried to find the miracle that would solve my problems. I simultaneously grew out of my teenage acne and into my 20 something hormone acne. I didn't even get a breather between the two! While I was grateful that I was rarely visited by temporary red face mountains I wasn't pleased with the new even texture that covered my lower cheeks and chin. Right after I got engaged my wonderful aesthetician friend gently commented on the 'congestion' of my skin and offered to do facials as a wedding/engagement gift. As she worked on my we talked a lot about how less is more on your skin and she recommended some clean make up (NS Minerals - I'll post on clean make up and why it's great soon) that is essentially the same as wearing no make up in terms of negative impact on your skin. After she worked her finger numb getting my face wedding ready (or at least presentable) I starting thinking a lot more about taking all the chemical and fragrant filled skin care bottles out of my regime and making it simpler. My sister first mentioned the oil cleansing method a while before I was to the point of trying it out (I really like buying beauty products, I don't know why, but marketing of those suckers just traps me! ), but when I was ready to try it I started doing some research. I don't need to recreate the wheel, so here is a super informative post that convinced my and explains why oil cleansing works. I use an oil vial to mix up my concoction. My mix is about 20% caster oil and an 80% mix of grapeseed and sunflower seed oil. You may read about using olive or coconut oil - don't! I did at first and didn't see really negative results, but you might! Coconut oil is a comedogenic which will eventually clog your pours - and olive oil just doesn't work, I don't have a scientific reason why (which kills me, I want to know why!). Here is the best post on troubleshooting through the oil cleansing method, I learned a ton here and have changed up my regime! She has great suggestions on oils to add in for great results too. Each night I pour some oil into my hand and rub it all over my face. No need to remove makeup beforehand, this will get everything off. I then take a wash cloth and soak it in hot water, wring it out and let it steam on my face. I do this twice, sometimes a few more if I wore a lot of make up that day. That's it. If I'm breaking out a little then I mix up a few drops of tea tree oil (which you can also add into your oil mix!) and vitamin E in my hand and rub it onto my face. then it's off to bed! No need to wash your face in the morning, this will actually make your skin overproduce oils and aggravate your skin - less is more! Keep your wash clothes clean! I change mine out every two days and replace them with new wash clothes every 6-12 months. They cost maybe $5 for a big pack, totally worth it. You'll save lots of money and time! No eye make up remover, no lotion, no night creams, no acne creams, no face wash.
Exfoliate at least once a week. I like doing a mask with whatever I feel my skin is needing (I talk about it in this post, but I'll write up a post soon devoted to natural skin masks) about once a week. I also add some baking soda into my oil mix about once a week to slough off dead skin. Your eyelashes will grow! With the oils being slathered on those beauties it'll give them the nutrients they need as well as relieve them from the damaging cleansers and chemical. Hurray, added perk! So what do you say, are you ready to discard the bottles and try this home remedy? Ok, I need to try this. I always complain that it isn't right that I should have to deal with acne and aging at the same time. Like the two should NOT go together. I am definitely going to have to try this out!! This is so interesting. I never had much acne as a teenager but it got worse in my twenties! Sometimes I wonder if the cleansers I am using are just making things worse. I'll have to try this!